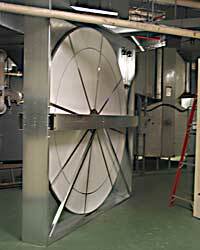 To replace large decommissioned or aging energy recovery ventilation (ERV) wheels, Airxchange FA Series field-assembled cassettes are intended reduce installation times and costs. The cassettes are factory-built, tested, marked for reassembly, and then disassembled for shipment. Each cassette is precision cut into sections – typically halves or quarters – for delivery through standard doorways and rapid on-site assembly. Every assembly carries a 5-year warranty. Wheels are available for applications from 100 to 35,000 cfm in integrated DX, air-handling, or stand-alone ERV systems, or as add-on options.